Download the right version of this Android manager to the computer running Windows OS or Mac. In the part below, lets' work with the Mac version. First, please connect your Android device with a USB cable. 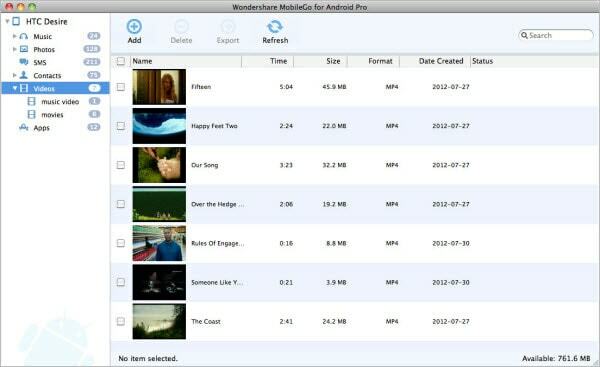 On the video management window, you can click Add to select and videos you want to play on your Android device. When adding videos, please pay attention to the video formats as Android devices supported video formats are MP4 and 3GP. To export videos, simply click Export to save them to your Mac effortlessly. In addition, you can preview the videos with the built-in video player, delete those you don't want, create video folder, etc. Copyright © 2012 CZQSOFT.COM. All rights reserved.